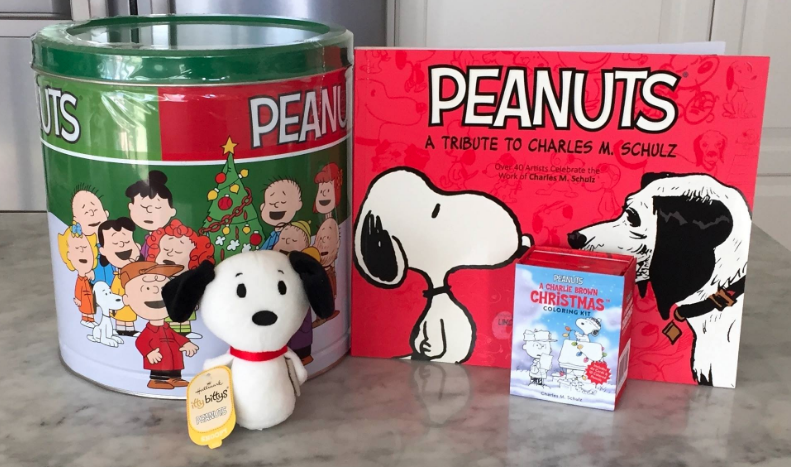 Christmas with Snoopy and the Gang + Giveaway! • Sure to be popular with your kids: Munch your way through the holidays, then savor the memories all year long with a collectible Peanuts popcorn tin…filled with three different flavors of popcorn, of course! • Celebrate the legacy of Charles Schulz through the eyes of some of the world’s world’s best-known names in comics, children’s books, comic strips, cartoons, and webcomics, including Matt Groening of The Simpsons and Raina Telgemeier (Smile). The book is called Peanuts: A Tribute to Charles M. Schulz from Boom! Studios. • Celebrate the beloved holiday classic with a Charlie Brown Christmas Coloring Kit—the perfect companion to the Great Pumpkin coloring kit we gave away earlier this year. This portable coloring kit includes 10 colored pencils and 40 illustrated cards connected by an accordion fold, featuring text on alternating cards so the story can be read as you bring this timeless favorite to vibrant life. Once complete, you can display or share your art the whole season through. • Finally, the most adorable Snoopy you’ve ever seen: A Snoopy Itty Bitty from Hallmark. This incredibly soft and tiny Snoopy plush truly is the stocking stuffer every Peanuts fan hopes to find this season. And now for the VERY best part… ONE lucky She Saved reader (US Only please and sorry) will win all of the items shown above! I will leave this giveaway open until December 19th, 2016 … once closed, I will select one winner who will have 48 hours to contact me to claim their prize! GOOD LUCK!! Sally is my favorite Peanuts character. My favorite Peanuts character was Shroeder. He played the piano and he was good friends with charlie Brown. My favorite peanut character is Linus! Such iconic characters I grew up with.